Apr 10, 2019 at 09:00a.m. - Apr 10, 2019 at 11:00a.m. 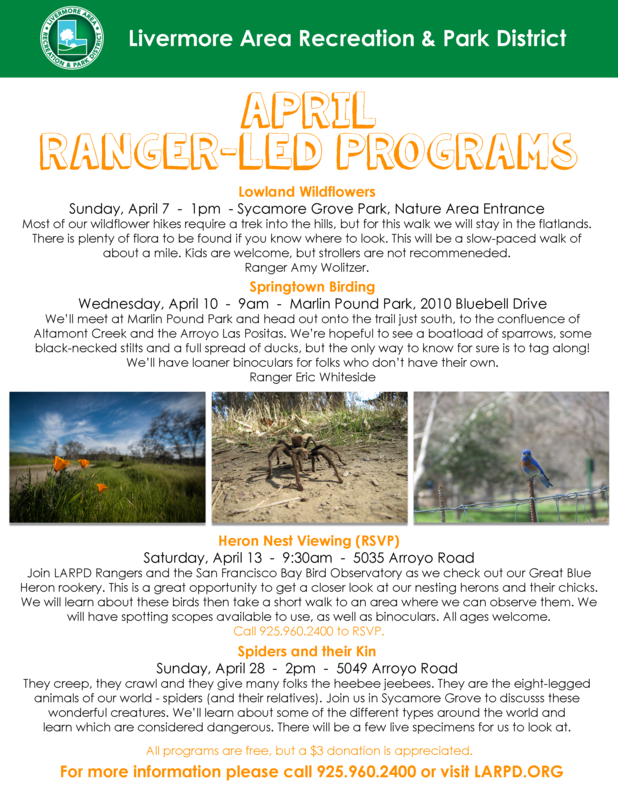 Meet at Marlin Pound Park and head out on the trail to the south, to the confluence of Altamont creek and the Arroyo Las Positas. We are hoping to see several sparrows, some black-necked stilts and a flock of ducks, the only way to know for sure is to tag along! Ranger Eric will have some loaner binoculars for folks who don't have their own, Cancelled if raining heavily. Join Ranger Eric Whiteside at Marlin Pound Park, 2010 Bluebell Drive.